A wonderful 4 bedroom villa on a 1000sq metres plot with a pool on two levels and a tennis court set in a quiet location and unique, unforgettable view to the sea.This villa is in the village of Argaka it lies on the edge of the Paphos forest and it overlooks the Mediterranean Sea. It provides a beautiful mountain view. Its' location is perfect to explore the neighboring areas of the west cost. A pergola provides a shady outdoor dining spot making full use of the barbecue and traditional clay oven provided. The lawned area of the lower tier garden. This villa also has the use of a shared tennis court. TV and DVD player, huge spaces inside and out, landscaped gardens and a great play area for the children to enjoy and enjoy a game of tennis on our shared tennis court. 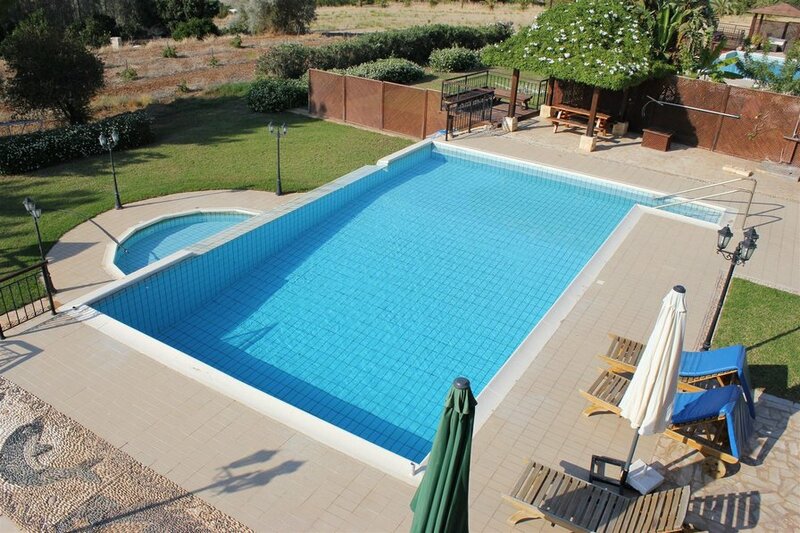 Swimming pools Infinity pool 6 x 12 metres and additional children's pool. Refundable breakages deposit of €250 required on arrival, to be refunded on your departure (subject to satisfactory property inspection). Air conditioning --- Bedroom Units are Included in the price,,,The living room units are option and charged at €10 per unit per day. Argaka is an unspoilt Cypriot village situated between the sea and the mountain slopes. It is home to many good restaurants. Argaka has a sandy beach with clear warm sea. Views of the sunset over the Akamas Peninsula are outstanding. The tavernas are welcoming and very good value and there are two small supermarkets. About 2 minutes drive from the villa lies the small town of Polis with its attractive main square where it is a pleasure to linger with a cool drink and enjoy the relaxed atmosphere. The town offers many restaurants, bars and cafes as well as a bank, post office, pharmacy, hairdresser and many interesting shops. Just a few kilometres further west is the small town of Latchi with its attractive harbour and well known restaurants serving a wide choice of food including many varieties of freshly caught fish. There is a water sports centre and boat hire.. Within walking distance there are several local tavernas and an Irish bar offering live entertainment and reasonably priced meals. There is also a bakery and 3 mini markets in the village or travel 5 minutes by car to Polis for the main supermarket and a variety or good restaurants and banks. Latchi is about 15 minutes by car and worth a visit for a good selection of restaurants serving freshly caught fish in the harbour. Situated in the sleepy hillside village of Argaka, these villas offer the ideal location for complete relaxation with the advantage of being only a 10 minute drive away from the more lively Polis and Latchi with it's beautiful harbour and many tavernas. Offering stunning views over the Akamas Peninsula. An ideal location for walking and cycling with a beautiful coastline and countryside to explore. About 10 minutes drive from the villa lies the small town of Polis with its attractive main square where it is a pleasure to linger with a cool drink and enjoy the relaxed atmosphere. The town offers many restaurants, bars and cafes as well as a bank, post office, pharmacy, hairdresser and many interesting shops. Just a few kilometres further west is the small town of Latchi with its attractive harbour and well known restaurants serving a wide choice of food including many varieties of freshly caught fish. There is a water sports centre and boat hire.